Netflix is finally working on Linux! No, there's no native Linux Netflix application, but with a patched Wine build, you can now use Netflix under Linux. Thanks to a campaign by IHeartUbuntu to get Netflix running on Ubuntu and the work of Erich Hoover, Ubuntu users can now use Netflix through Wine (with some patches) and Microsoft Silverlight, all installable from a PPA. For those who are not familiar with Netflix, this is an on-demand TV shows & movies streaming service available in USA, Canada, South America, UK, Ireland, Sweden, Danmark, Norway and Finland. I like to test everything I post, but since Netflix is not available where I live, I was unable to test this. Hopefully it will work for you using the instructions below. The commands above will install a patched WINE which doesn't overwrite your current Wine installation, along with a Netflix web app that automatically downloads and installs Firefox for Windows and Microsoft Silverlight. The Netflix app is available for both 32bit and 64bit while the patched Wine package is only available for 32bit, but it should work on 64bit thanks to Ubuntu's multi-arch support. make sure the universe, multiverse and restricted repositories are enabled via Software Sources (on the first tab). 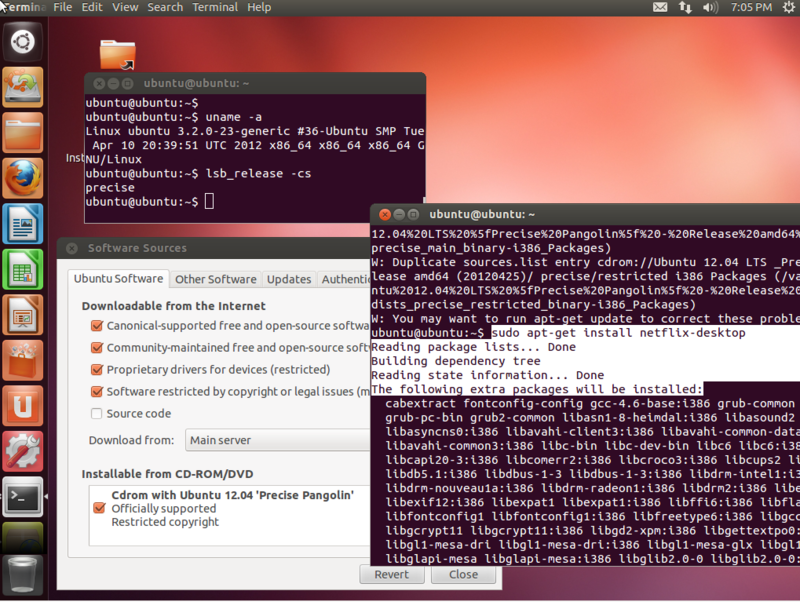 To open Software Sources in Ubuntu 12.10, go to System Settings > Software Sources or, in Ubuntu 12.04 or older, you can access it via Ubuntu Software Center > Edit menu > Software Sources. Then run an "sudo apt-get update" and try to install netflix-desktop again and it should work. Once installed, you can launch the Netflix Desktop web app through Dash / the menu. By default, the application runs in full screen but you can exit full screen mode by pressing F11. For other Linux distributions: to get Netflix to work, see the instructions available @ iheartubuntu.com and compholio.com (use the patches from compholio!). Fuduntu users: the patched Wine is already available in the Fuduntu repositories, so all you have to do is install Firefox for Windows and Microsoft Silverlight to be able to use Netflix. For Arch Linux, Netflix Desktop can be installed via AUR. Tip: since the Netflix Desktop web app comes with just a window titlebar (no menu, tabs, address bar, etc. ), if you want to use this custom Wine build with other websites that require the Microsoft Silverlight plugin, launch Firefox for Windows (Wine) from the newly created desktop shortcut. Or, to launch it from Unity's Dash, search for "Mozilla Firefox" (the native Firefox application for Linux should show up as "Mozilla Firefox Browser" so the names are not identical). Alternatively, in the Netflix Desktop web app, you can use F11 (to exit full screen), then press ALT + V and from the View > Toolbar menu, enable the Menu Bar and Navigation Toolbar.